I'm deeply saddened to report that Jim Thiel, founder of the loudspeaker company that bears his name, passed away on September 18 at the age of 62. Jim Thiel was one of the founding fathers of American high-end audio. His story is archetypal; he built a loudspeaker in his garage, initially for his own use, because he thought he could improve upon the commercial offerings of the time. He went on to co-found Thiel Audio in 1976 to manufacture his unique time- and phase-coherent design. Every Thiel loudspeaker, from the first garage-built model to today's flagship, is based on the principle that time- and phase-coherence is a fundamental prerequisite of a high-fidelity loudspeaker. I greatly admired Jim as a loudspeaker designer and as a man. He was the consummate audio nerd, a term I use endearingly. Jim was 100% engineering and 0% spin or marketing hype. He was just as likely to tell you about shortcomings of his designs as the attributes. And how he loved to talk about loudspeaker design. He had an amazingly inventive and creative mind with a laser-like focus on improving performance. To give you an idea of how he approached his craft, I'll share with you two stories he told me at CES two years ago. The first describes how he had conceptualized the coaxial driver that positions a dome tweeter within a midrange driver. He considered the advantages of such a driver and over the next year thought about how it would be constructed. He put off building a prototype because he believed that he'd need to dedicate six months to a year to perfecting the driver. In the nonce, he had other more pressing design commitments that required his attention. One Saturday, he was overcome with curiosity and made what he thought would be the first of dozens and dozens of prototypes. A couple of hours later, he had, to his great astonishment, a working prototype that performed nearly flawlessly. That driver, which delivers perfect time and phase coherency no matter what the listening distance or listener position, became the cornerstone of the Thiel line. What's remarkable is that Jim had worked out, purely in his head, every last detail of the driver's construction needed to make it perform as intended. The trial and error took place in his imagination. The second story that exemplifies Jim's innovative solutions to engineering challenges is the development of the flat diaphragm with radially ribbed contours. Jim told me he had been working with different materials and cone shapes in an effort to produce the stiffest material with the lowest mass. His efforts paid off with about a 10% increase in stiffness and a 10% reduction in mass. 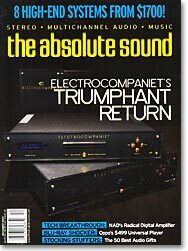 Most loudspeaker designers would have been thrilled by this advance and moved the driver into production. But Jim told me that he asked himself: "Why settle for a 10% increase in stiffness? Why not try for something with ten times the stiffness?" This attempt to leapfrog the traditional restraints resulted in the radically different driver seen in the Thiel CS3.7. Despite his enormous talents, Jim was a humble man, completely lacking in ego or hubris (in a field where ego and hubris are rampant). He also had enormous integrity, never producing a product unless he thought it offered the very best performance he could deliver to his customers. Jim Thiel embodied all that is great about our industry. High-end audio has lost a gentle soul and an irreplaceable voice. Thiel welcomes everyone to share their thoughts and memories of Jim at thielaudio.com.